While spring -- and the gradual onset of warmer weather -- only just started, Starbucks is already introducing a new cold brew flavor to lure you away from your usual hot coffee drinks. 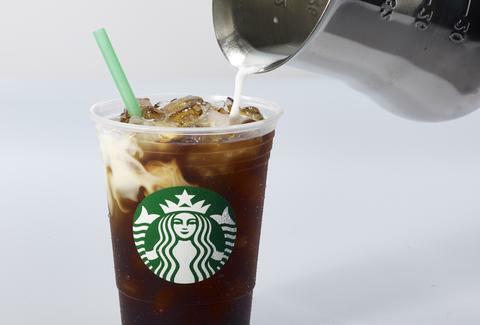 Starbucks calls it Toasted Coconut Cold Brew and as of Tuesday, April 4, you can get it at the coffee giant's locations across the United States and Canada for a limited time, according to a press release. Beverage developers at the chain said the drink was inspired by a traditional shaved coconut and honey candy in the Dominican Republic called jalao. Starbucks baristas make the drink by taking Nariño 70 Cold Brew coffee, lightly sweetening it with toasted coconut syrup, then finishing it with a float of coconut milk that appears to cascade across the cup. Basically, it's cold brew coffee, with a tropical twist. Sure, cold brew just seems to taste better when it's at least 80 degrees and abundantly sunny outside, but considering the rollercoaster of nice/crappy/nice weather lately, a day like that probably isn't too far off. Tony Merevick is Cities News Editor at Thrillist and has yet to have his first cold brew of the season. Send news tips to news@thrillist.com and follow him on Twitter @tonymerevick.